(Gütersloh, August 29, 2014) – The international media and services company Bertelsmann made significant progress in implementing its growth strategy in the first half of 2014, increasing both its revenues and Operating EBITDA. Consolidated revenues from continuing operations increased by almost seven percent to €7.8 billion euros, the highest level in seven years (H1 2013: €7.4 billion). This revenue growth was driven, in particular, by the strategic transactions of the past 18 months. They include the combination of Penguin and Random House, Arvato’s acquisition of the financial services company Gothia and the e-commerce service provider Netrada, and the acquisition of full ownership in the BMG music rights company. Operating EBITDA, which included startup losses for new businesses and negative foreign exchange effects, was €1,015 million, slightly above the high level of the previous year (H1 2013: €1,011 million). The German and Dutch TV operations, the book publishing business, the music rights business and some of Arvato’s service businesses all grew their results. Operating EBITDA was negatively impacted by the performance of structurally declining businesses, the magazine business, and the weak market situation in France, where the operating EBITDA of Bertelsmann’s businesses declined by €33 million year-on-year. The EBITDA margin was 12.9 percent (H1 2013: 13.7 percent). At €254 million, the Group’s first-half net income was below the high level of the previous year (H1 2013: €419 million), which was influenced by positive special items. Earnings during this reporting period were negatively impacted by an €88 million impairment on RTL Group’s TV activities in Hungary, where the parliament recently approved a special tax on advertising. In the past few months, Bertelsmann has systematically invested in strengthening its core businesses. For example, RTL Group expanded its family of channels in Germany, Croatia and South-East Asia; Penguin Random House acquired the Spanish- and Portuguese-language trade publisher Santillana Ediciones Generales. Meanwhile, structurally declining businesses were further downscaled or sold, as was the case with Brown Printing in the U.S.; Bertelsmann announced its plans to withdraw from the club business both in Germany and in Spain. Bertelsmann significantly grew its digital businesses, organically and through acquisitions. For example, in the first half of 2014, RTL Group generated a total of 15.7 billion online video views – a year-on-year increase of 226 percent. In July, the group also secured a majority stake in SpotXchange, a marketer of online videos. Penguin Random House expanded its e-book portfolio to over 80,000 titles, extending its market leadership; Gruner + Jahr further strengthened its market position in digital marketing by acquiring the French online video marketer Advideum. Arvato continued to grow as a service provider for leading IT, high-tech, and e-commerce companies. During the reporting period, RTL Group acquired a majority stake in the TV production company 495 Productions. Arvato became a leading European service provider of e-commerce services to the fashion and lifestyle sector, following its acquisition of Netrada. BMG purchased the music publisher Talpa, as well as the Montana and Hal David rights catalogs. Bertelsmann also advanced the expansion of its education business as a strategic investor in the University Ventures II fund with a commitment to invest hundreds of millions. Bertelsmann expanded in all of its three growth regions. The Bertelsmann Asia Investments fund increased its portfolio in China, achieving significant gains, for example, from its participation in Mushroom Street, a leading online shopping community for women. BMG entered the Chinese market. In India, Bertelsmann invested in the e-commerce platform Pepperfry, as well as in a digital fund. In addition, Bertelsmann teamed up with a Brazilian investment firm to found a new venture capital fund focusing on technologies in the Brazilian education sector. Positive contributions during the reporting period came primarily from Mediengruppe RTL Deutschland, which achieved record results, and from RTL Nederland. Meanwhile, RTL Group’s results in France were negatively impacted by a weak advertising market. Penguin Random House increased its revenues to nearly €1.5 billion following its combination making it the world’s largest trade book publisher on 1 July 2013, and placed numerous titles prominently on the international bestseller lists. Gruner + Jahr continued its strategic transformation from traditional magazine publisher to creative house of content, but recorded lower revenues than in the same period last year due to the general downtrend in the magazine market, as well as portfolio adjustments. However, Gruner + Jahr’s revenues from digital activities increased in all countries. Growth drivers at Arvato included services for international customers in the Internet, high-tech, healthcare and automotive industries, and financial services. While revenues and operating EBITDA at Be Printers, the division that unites Bertelsmann’s gravure and international offset printers, declined due to the difficult market environment, revenues in the Corporate Investments division grew through business growth and the full consolidation of the music rights company BMG for the entire reporting period. RTL Group launches three new TV channels: RTL Kockica in Croatia, Geo Television in Germany and RTL CBS Extreme HD in Southeast Asia. Fremantle Media buys 75 percent of shares in the reality-TV producer 495 Productions, expanding its presence in the US cable broadcasting market. Fremantle Media and Vice Media launch “Munchies,” a new multichannel platform for digital content related to food and nutrition. The leading European entertainment network generated revenues of €2.7 billion in the first half of 2014 (H1 2013: €2.8 billion). This slight decline in revenues is primarily due to difficult market conditions in France and the decline in revenues at Fremantle Media. However, operations in the Netherlands in particular showed positive developments. RTL Group’s operating EBITDA totaled €612 million (H1 2013: €631 million) and was particularly affected by the marketrelated drop in earnings at Groupe M6 and RTL Radio in France, and by Fremantle Media. However, Mediengruppe RTL Deutschland achieved record earnings and RTL Nederland was able to significantly increase operating profits. Due to the introduction of a new tax on advertising revenue by the Hungarian parliament, an impairment of €-88 million was made to the TV operations in Hungary. As a special item, this has no impact on RTL Group’s operating EBITDA. RTL Group was largely able to maintain its leading audience positions in its core territories, even though the soccer World Cup in June was broadcast by competitors. Mediengruppe RTL Deutschland’s audience share in its main target group was slightly down year on year to 29.2 percent (H1 2013: 31.2 percent). However, RTL Television was still the clear number one among 14- to 59-year-old audiences. RTL Nitro, the channel launched in 2012, almost doubled its audience share in the first half of 2014 to 1.5 percent (H1 2013: 0.8 percent). In France, the Groupe M6 family of channels registered a slight decrease in audience share. The new channel 6ter, launched in December 2012, developed positively. The audience share of the Dutch family of channels around RTL 4 was also slightly below the level of the first half of 2013. In the digital domain, RTL Group continued to show dynamic growth thanks to its online platforms, mobile applications and YouTube activities. 15.7 billion online video views were generated in the first six months of the year – a 226 percent increase compared to the first half of 2013. Online video advertising revenues also increased significantly during the reporting period. John Green’s #1 bestselling “The Fault in Our Stars” sells more than 5.7 million copies published by Penguin Random House imprints, January–June. Penguin Random House’s publishing presence in Spain and Latin America greatly expands with the acquisition of Santillana Ediciones Generales’s trade publishers on July 1, 2014. Penguin Random House’s new corporate logo and brand-identity system, featuring the imprint logos, is introduced worldwide. G+J strengthens its position in ad marketing by acquiring Veeseo and a stake in Trnd, becoming Europe’s biggest provider of content recommendations. In France, Prisma Media buys a stake in the country’s leading video marketer, Advideum, at the end of 2013, further enhancing its market position in digital marketing. G+J Germany celebrates the anniversary of the printed editions of “Brigitte” (60 years) and “Gala” (20 years), and expands its brands in digital to about 30 emags and more than 50 websites and apps. In the first half of 2014, Gruner + Jahr continued its strategic transformation from a traditional magazine publisher to a creative house of content. Driven by the decline of the magazine business and portfolio adjustments, G+J’s revenues fell to €908 million during the reporting period (H1 2013: €1.0 billion). At the same time, Gruner + Jahr’s revenues from digital activities increased across all countries. As a result of the overall decline in revenues, operating EBITDA fell to €77 million (H1 2013: €108 million). At G+J Germany, the decline in the magazine business had a significant impact on revenues and earnings. G+J countered this decline with a product campaign based on the publisher’s leading brands such as “Brigitte” and “Gala” and with the launch of new titles (e.g., “Flow”) as well as numerous special issues. The company continued the expansion of its digital business. G+J strengthened its position in the advertising market through acquisitions such as Veeseo and Trnd. Overall, the international business showed a downturn. Activities in Austria and China generated revenues and earnings below the levels of the previous year. Meanwhile, despite weaker revenues, G+J Spain increased its earnings, thanks to structural measures taken in 2013. G+J France strengthened its position in digital marketing by acquiring France’s leading video marketer Advideum shortly before the end of 2013 and kept its revenues largely stable. Dresdner Druck- und Verlagshaus was able to slightly increase its revenues and earnings year on year and on a like-for-like basis. Arvato’s acquisition of Netrada turns it into one of the leading European providers of integrated e-commerce services. Arvato acquires five more service centers in Germany. Expansion of services businesses and successful new customer recruitment in Turkey, Poland and India. The international services provider Arvato grew in the first half of 2014, both organically and through acquisitions, and increased its revenues in the reporting period by 5.5 percent to €2.2 billion (H1 2013: €2.1 billion). As a result of the revenue growth, operating EBITDA increased slightly to €162 million from €160 million in the same period last year; the earnings contributions of the acquisitions compensated for declines in earnings in individual businesses. During the reporting period, Arvato grew its revenues and earnings in areas including services for international customers in the Internet, high-tech, healthcare and automotive sectors. With the acquisition of Netrada, completed on February 1, 2014, Arvato became a leading European provider of e-commerce services, strengthening its position in the field of supply-chain management. The financial services business, which benefited from the takeover of Gothia Financial Group in the previous year, also contributed to Arvato’s growth. In contrast, revenues from storage media replication continued to decline, as expected. Arvato improved its position in key growth markets and industries in the first half of the year, expanding the services businesses in India, Turkey and Poland and acquiring new customers. Arvato also consolidated its leading position in the European market for customer relationship management by taking over five service centers. Upcoming contract renewal with Penguin Random House increases volumes and boosts capacity utilization at Be Printers USA. Production of a major order for an Italian client on the occasion of the soccer World Cup. Adoption of a “Future Package” by the workforce safeguards jobs and significantly lowers costs at the Ahrensburg site. The gravure printers and international offset printing plants, grouped into the Be Printers division, generated first-half revenues of €482 million in a market environment characterized by declining print runs and surplus capacity (H1 2013: €512 million). 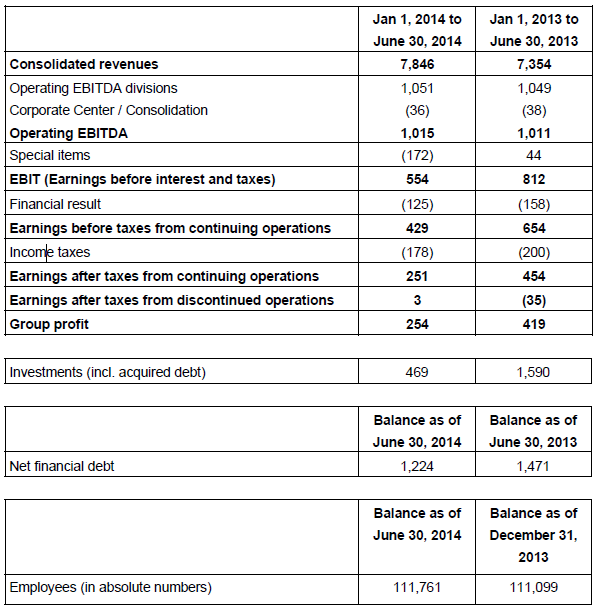 The division’s operating EBITDA decreased to €25 million (H1 2013: €29 million). In Germany and the UK, the gravure division Prinovis was able to secure printing contracts for several major magazine packages for several years. However, lower overall print volumes caused a slight decline in revenues and earnings at Prinovis. Production at the Itzehoe plant was terminated on April 30, 2014, as planned. In Ahrensburg, the workforce adopted a “Future Package.” Be Printers Americas agreed on a multiyear contract extension with Penguin Random House, which will increase capacity utilization at the company. Continued cost discipline served to enhance results. Due to macroeconomic developments in Italy and Spain, Be Printers Southern Europe recorded lower order volumes and further price declines. BMG continues its expansionist course by taking over the music rights companies and catalogs Talpa Music, Montana and Hal David and initiates its market entry in China. Education business is expanded through commitment to invest an amount in the hundreds of millions in a second University Ventures fund. Digital activities in the growth regions China, India and Brazil strengthened through fund participations and direct investments. In the first half of 2014, Corporate Investments reported an increase in revenues to €254 million (H1 2013: €235 million) and operating EBITDA of €16 million (H1 2013: €-10 million). In particular, the growing business and full consolidation of the music rights company BMG for the entire half-year – BMG has been wholly owned by Bertelsmann since March 30, 2013 – had a positive effect. By contrast, the club and direct-marketing businesses declined as planned. BMG continued its growth course during the reporting period, acquiring the music rights companies or catalogs of Talpa Music, Montana and Hal David, with numerous classics in their portfolios. At the same time, BMG signed new contracts with several wellknown artists, including the Smashing Pumpkins, The Strokes, George Ezra and the Beatsteaks. The company was Germany’s most successful music publisher in the first half of 2014 – almost 21 percent of all singles in the German charts were from BMG. In addition, BMG entered the Chinese market. In the field of education, Bertelsmann continued to drive forward the preparations for the expansion of this business, and committed to investing a sum in the triple-digit millions in a second University Ventures fund. In Brazil, Bertelsmann teamed up with a partner to establish a fund for investments in the education sector at the beginning of the year. The BDMI digital investment fund with a focus on the United States, and BAI for investments in promising companies in China, acquired new shareholdings during the reporting period, including one in the IT recruiting platform Lagou.com. In India, investments were made in growth businesses including online marketplaces for furniture and real estate. Revenues and earnings from the club and direct-marketing businesses continued to diminish as planned. The sale of the businesses in Czech Republic and Slovakia was completed on March 31, 2014. In June, the decision was made to discontinue the German club business at the end of 2015. The sale of the 50 percent stake in Círculo de Lectores to the co-owner of Grupo Planeta went ahead and was completed on July 29, 2014. During the reporting period, the Corporate Center and the divisions together advanced the multiyear Operational Excellence program to optimize business support processes in the areas of HR, finance, IT and sourcing across the Group. Figures of H1 2013 and as of December 31, 2013 are adjusted due to the first-time application of IFRS 11 “Joint Arrangements”.